After Alex had travelled half way around the world the day before to join me in Singapore, we flew out of Changi and arrived in Malaysia before lunch time. Bikes collected from oversize baggage and car hire sorted, we headed towards Kuala Lumpur and then on towards Ipoh and the Cameron Highlands. It wasn’t long before the jet lag caught up with Alex and he was snoozing away to my harmonious radio karaoke voice! 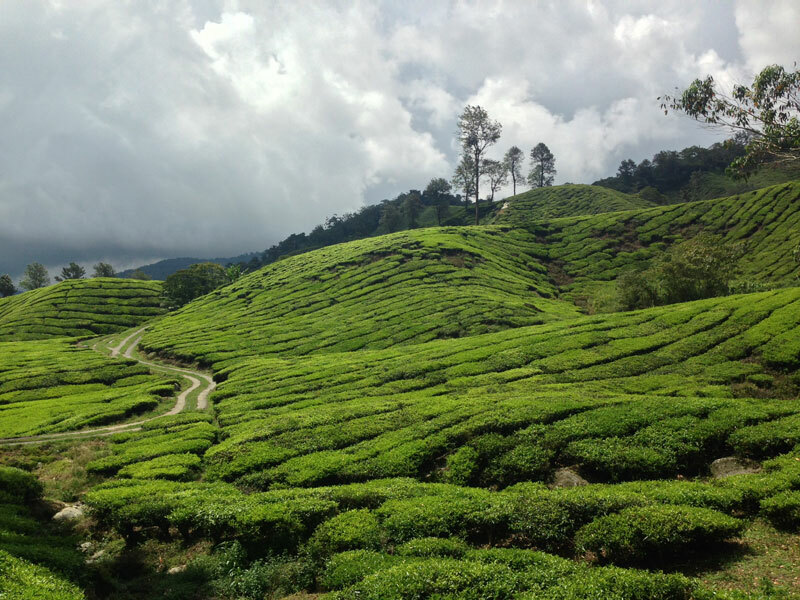 With the city behind us, the roads were clear and the kilometres were being eaten up at a fair pace and within two and a half hours we had made it to Tapah at the foothills of the Cameron Highlands. From this point on, the road (and what a road!) only goes upwards. Snaking through the rainforest and into the clouds, the road was flanked by precarious drops. Added to this mudslides and ‘rivers’ occasionally blocked the route – we were starting to get a taste of what we were in for. This was not going to be your average cycling trip. From Tapah to our destination in Ringlet, the journey is about 50km, half an hour of driving usually. After an hour of driving we finally made it to the top of the 1,000m climb. “If there’s only one thing we do on this trip, we have to cycle that!” Alex said. The challenge had been laid down. Turning the corner we arrived at a 20% incline, the driveway to our wonderful tudor style hotel, The Lakehouse. Built by the late Colonel Stanley Jack Foster, a retired British Army Officer, in 1966 originally as a country residence for his family, the hotel is located on a hillside position overlooking rolling hills, forests and of course the lake. Stepping out of the car we were surprised to have left the humidity of the tropics at the bottom of the hill and were now in 25oC heat with only half of the humidity. On entering the hotel, the sight of grandfather clocks, ring dial telephones and open fireplaces whisked us into a bygone era where I think the only modern elements were two carbon fibre racing cycles. After a bite to eat, we headed out to do a bit of reconnaissance for the ride the following day. 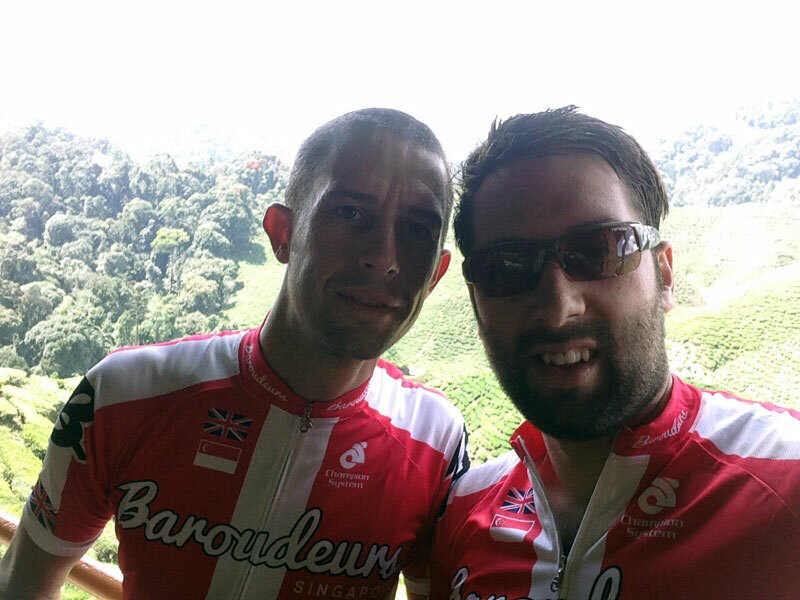 The scenery was stunning and the riding was going to be a little different to that encountered in Singapore. We returned to the hotel to build up the bikes, plan our route and (ahem!) ‘hydrate’. You can’t start a big day in the saddle without something substantial in your belly! Full English, and lots and tea and juice. The first few kilometres lulled us into a mindset that everything was going to be ok and that the villages that we could see ahead of us in the tree line was possibly (hopefully) going to be reached via meandering 3% roads. How wrong we were! At kilometre 3 the road took a decidedly skyward angle right at about the point a savage dog took a liking to our bikes! And that dog could sprint. An unexpected 500m out of the saddle effort at a 7% gradient followed. We were pretty happy when the dog decided to give up on our ankles. I for one was not sure how much longer I could sustain that pace. 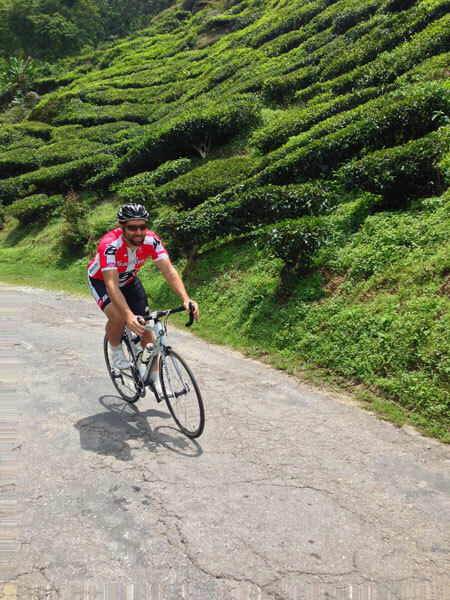 With the dog now retreating, we continued the climb at a more realistic pace and at higher elevations we were rewarded with some magnificent views to the tea plantations from the switchbacks along the road. For a moment or two the views took our minds off what our screaming legs. Several of the tea shops and cafe’s along the climb were extremely inviting, but we pressed on through the rainforest and tea plantations into Habu and Tanah Rata as we followed the road to Taman Tringkap. We reached the summit an hour after we started and were then rewarded with the 500m descent back to Ringlet. A combination of sharp off camber hairpins and fast sweepers kept us alert as the speed and commitment increased on the way down. Traffic was minimal, which gave us the chance to use the whole road for much of the return journey until we peeled off and headed for a cup of tea and a few slices of cake, which at that point we had no idea we were going to have to earn. 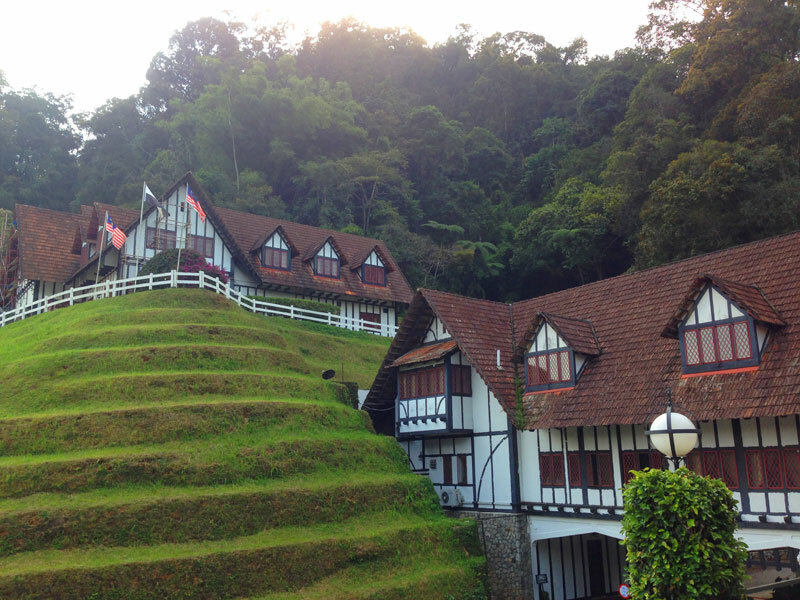 The Boh Tea Plantation was unsurprisingly 350m above our current level. A combination of dirt tracks and single carriageway roads led us to our destination through spectacular scenery. Every 5 minutes we were stopping to take photographs, which was no bad thing given that the road had a habit of turning up the odd 12 and 13% gradients on the dirt tracks. Cyclocross bikes would have been more appropriate for a few sections of this track, but we reached the tea shop with smiles on our faces ready for our fill of sugary tea and cake. After consuming seconds and then thirds, we hopped back on to the bikes and made our way back to the hotel. The staff at the Lakehouse were most accommodating. They opened up the restaurant terrace for us (I’m sure to segregate us from the cleaner and far less smelly guests) and fed us with steak sandwiches and lashings of that famous recovery drink they call Heineken! I drew back the curtains to what was a glorious day. We decided that today was going to be a day of pain, the day we tackled the return journey to Tapah. We didn’t want to risk putting the ride off until our final day in case the weather turned, which would have made the descent far too dangerous, although it may have made the ascent far more pleasurable! Today, we would eat like kings at breakfast. A three course breakfast. Cereal for our starter, a full English for our main course and fruit for our dessert. We were going to need every last calorie for this ride. After an hour and a half it was time to clip in and push down on the pedals. 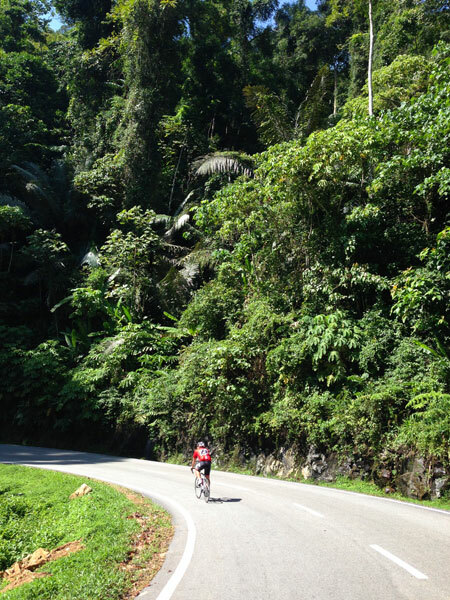 The first 4km into Ringlet town was uphill, but the following 40km was a wonderful descent through virgin rainforest. The forest canopy kept the sun off us and the condition of the road prevented the pace getting silly. Instead, we sat back and thoroughly enjoyed the ride for what it was; a spectacular easy going ride that gave us the chance to sit back, chat and soak up the scenery. Stalls at the side of the road were selling honey from the forest to passers by and villagers greeted us with waves and friendly smiles without exception. 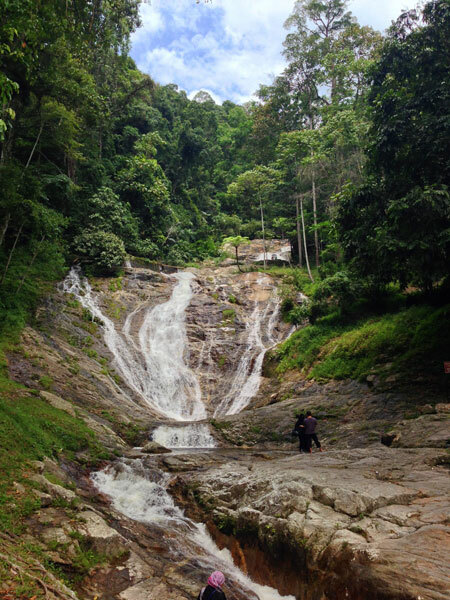 On the way down to Tapah, we made mental notes of a few places from which we could refill the water bottles and stop for a bite to eat to prevent us getting caught out on the return journey. After an hour and a half we reached the lowest point of the ride at Tapah where one thing was very apparent to Alex, it was extremely hot and humid in Tapah. The Garmin’s were indicating 18m elevation. We had started at the descent at 1,037m. A drink and a couple of packets of Skittles (needs must!) each prepared us for the return journey. The road instantly pointed upwards into the forest and the effort of climbing in 35oC heat with 85% humidity saw us wet through in no time at all. Since starting the ride, the temperature had increased by 8oC, but our incentive to climb was that the temperature was noticeably decreasing as we got higher. The climb was relentless, which allowed us to settle into our pace and make it to our first stop after two hours. We took a breather for about 15 mins at a glorious spot where the road passed a waterfall. The ambient temperature by the waterfall was much cooler and after a litre or so of water and the bidons refilled we got back underway. I expected the route to carry on much as the first half of the ascent where we had averaged about 20km, but the final half of the climb was much steeper. This combined with fatigue, saw the pace tail off and by the end of the ride both of us were looking down at the Garmin’s wondering like children ‘are we nearly there yet?’ After the final kilometres we turned the corner to be greeted by a giant strawberry sculpture which let us know we had finished the climb in a time of two and a half hours, but the temperature and humidity had taken its toll. 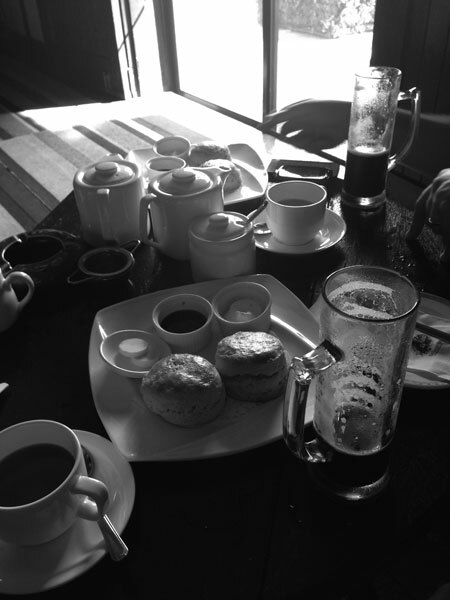 We were relieved to be descending to the hotel for our reward of tea, scones and Guiness! We had made it back to the hotel just in time. The scene overlooking the lake changed from clear, to cloudy, to torrential rain in the space of about an hour. Showered and changed, we retired to the bar for the evening where to our delight they had lit the open fire as the temperature had dropped to a chilly 20oC! We weren’t complaining though, it gave us the perfect excuse to sample their range of Port before retiring for the night. The final day of our trip was a wet, squally day so we wanted to stay on some fairly respectable roads and also set a few Strava PR’s and KOM’s along the way! We decided we would re-ride the road to Taman Tringkap with a view to riding this at a faster pace than on the second day now that we knew what to expect on the route. The previous day’s efforts had taken their toll on me though and Alex was dishing out the pain on the climbs in bucket loads. About three quarters of the way up the climb I let Alex go and met him at the top of the climb. Alex had gone way too much into the red on the final section of the climb and was now really suffering, but it had been worth it. Between us we had taken the KOM (Alex) and second place on the climb. Fortunately for us, Taman Tringkap was busy and we had chance to get our breath back as we filtered back down the hills through the traffic. The roads were busy, wet and greasy so no records were going to be set on the descent today. Dirt, gravel and branches – washed on to the road by the heavy rains were a common hazard as we descended. Branches could be bunny hopped, but the gravel on the bends was dangerous and unavoidable. There was no option other than to take it very slowly, so we stopped at all the tea shops we could find on the way down for a cuppa. We provided some entertainment for the locals who clearly thought we were completely mad riding in these conditions – they may have had a point! We arrived back at the hotel and thought it wise to clean and pack the bikes into the boxes straight away as we were probably not going to be in such a coordinated state later in the evening. With the bikes packed up, we settled into the wonderful lounge at the hotel to discover that we had drank all of their Heineken, all of the Gordon’s gin and all of the Port. Perhaps it was good that we were leaving the following morning, I don’t think that we were going to be so popular with the weekend guests that were starting to arrive! 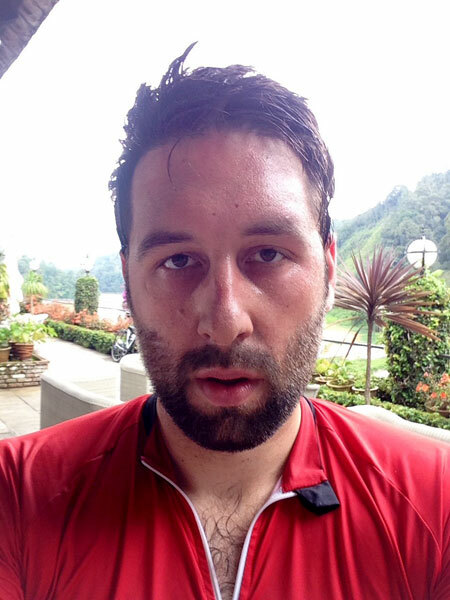 Thanks to Alex for dragging himself half way across the world to ride his bike! It was great to catch up again following the last trip to Corsica. Strangely enough, neither of us cycled when we met eight years ago, but we both got into cycling through various routes and have found a sport we both really love (and hate sometimes). And now the sport has also become an excuse for us and our families to catch up regularly despite living in different countries. So this cycling trip was not just about riding bikes and climbing thousands of feet, it was also about mates catching up, having a few beers and putting the world to rights. New York Gran Fondo next year Alex? !